Corvette Racing will enter a third Corvette C6.R driven by Ron Fellows and Andy Pilgrim in the Grand Prix of Mosport to be held at Mosport International Raceway in Bowmanville, Ontario, Canada on August 26, 2007. Former teammates Fellows and Pilgrim will be reunited for the ninth round of the American Le Mans Series at the famed Canadian track near Fellows' home in Mississauga, Ontario. "I'm excited, and I know that Andy's excited," said Fellows. "It should be good fun. Andy and I are both a part of Corvette Racing history, and this will be a real treat." Fellows and Pilgrim raced together at Mosport in August 2000, finishing second on a track that went from wet to dry in the closing laps. One month later, the pair won at Texas Motor Speedway, scoring the first of Corvette Racing's 55 victories. "I'm thrilled to be running with Ron in Canada," Pilgrim said. "Mosport is a very special place for Ron, and I'm excited about the prospect of being his teammate there. It's always great to race with Ron, and it's even better to be doing it at his home track. Mosport is extremely fast, and it's an eye-opening experience to race a GT1 Corvette there." The third Corvette C6.R will run in Arctic White paint that celebrates the limited edition Ron Fellows American Le Mans Series GT1 Champion Corvette Z06. Fellows drove a similar car at Sebring with Johnny O'Connell and Jan Magnussen, finishing second in class. The trio will reunite for next month's 24 Hours of Le Mans. "The team wanted to salute Ron and his many friends and fans at Mosport," said GM Racing Road Racing Group manager Steve Wesoloski. "Andy Pilgrim is the perfect choice as Ron's teammate at this special event. They scored the first win for Corvette Racing, and they're teammates in several races with Team Cadillac. 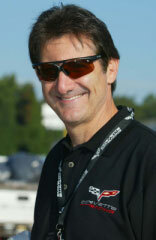 Andy's very active with the Corvette Museum and is very popular at Corvette events. This is an opportunity to spotlight two great Corvette racers." Both drivers have vivid memories of their first race together on the fast 2.459-mile Canadian circuit. "The race at Mosport was the first time I'd driven with Ron, and we almost pulled off the first win for Corvette," Pilgrim recalled. "We had a good effort, but lost the lead late in the race with rain tires on a drying track. It was a disappointing result, but we made up for it with a victory at the next race in Texas." "I'd convinced GM Racing that if we went to Mosport, I'd guarantee a win," Fellows reported. "That was pretty bold on my part, but we had it covered until the track dried up while our car was on rain tires. The change in weather was terribly unlucky, but it made for a great race." The Grand Prix of Mosport will be contested on Sunday, August 26, 2007. The 2-hour, 45-minute race will begin at 3 p.m. EDT and will be televised live on SPEED.